Great Britain's dressage team have been forced to change their plans for next week's European Championships because of the migrant problems in Calais. Thousands of migrants have been trying to enter the Channel Tunnel in France to try to get to the UK, causing disruption for travellers to Europe. The British riders will now fly to Germany, while their horses go from Harwich to the Hook of Holland. They had been planning to take the horses through the Channel Tunnel. 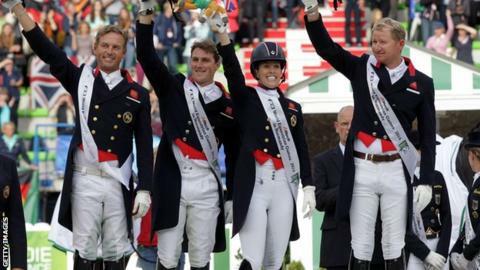 "It's a little bit annoying," Olympic gold-medallist and team member Carl Hester told BBC Radio Guernsey. He is part of a team that includes double Olympic champion, world champion and world record holder Charlotte Dujardin, Fiona Bigwood and Michael Eilberg. "From my home to Aachen [in Germany] is a 12-hour drive for the horses, which is quite a long time to be stuck in a horsebox where they can't move around, and we like to limit that as much as possible," Hester added. "Harwich will probably put another five hours on to our journey for the European Championships. "But our horses are very used to travelling, we live on an island and we compete in Europe and when we are in America they have to fly, so they're not completely new to having extra hours put on their journey. It's just a bit of a nightmare for us." But Hester, who grew up and learned to ride in the tiny Channel Island of Sark, says the welfare of their horses is paramount when the team travels. "The horses will arrive on Sunday and we don't compete until Wednesday, so they will have a couple of easy days," he said. "At this level we travel with a vet, a farrier, nutritionists and physios and the horses are superbly looked after." Can GB better London 2012 in Rio? Read more on Rio 2016: Can Team GB better London 2012 success?